THIS REPORT IS INTENDED ONLY FOR THE USE OF THE PERSON PURCHASING THE HOME INSPECTION SERVICES. NO OTHER PERSON, INCLUDING A PURCHASER OF THE INSPECTED PROPERTY WHO DID NOT PURCHASE THE HOME INSPECTION SERVICES, MAY RELY UPON ANY REPRESENTATION MADE IN THE REPORT. Limitations: Unless specifically included in the inspection, the following items and any related equipment, controls, electric systems and/or plumbing systems are excluded from this inspection: detached buildings or structures; fences and gates; retaining walls; underground drainage systems, catch basins or concealed sump pumps; swimming pools and related safety equipment, spas, hot tubs or saunas; whether deck, balcony and/or stair membranes are watertight; trees, landscaping, properties of soil, soil stability, erosion and erosion control; ponds, water features, irrigation or yard sprinkler systems; sport courts, playground, recreation or leisure equipment; areas below the exterior structures with less than 3 feet of vertical clearance; invisible fencing; sea walls, docks and boathouses; retractable awnings. Any comments made regarding these items are as a courtesy only. 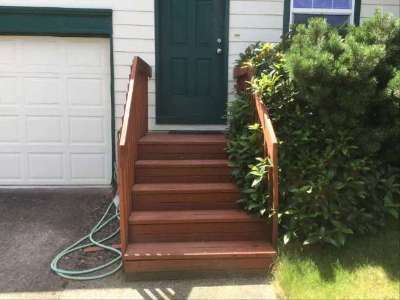 1) Steps at front of house had minor deterioration and loose steps/railing. Recommend qualified contractor secure steps and railing. 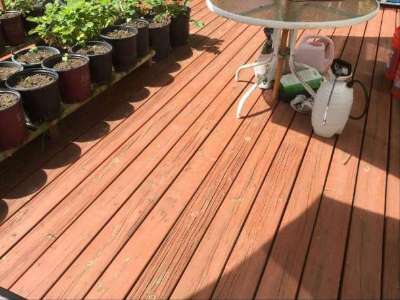 Worn decking surfaces should also be refinished. 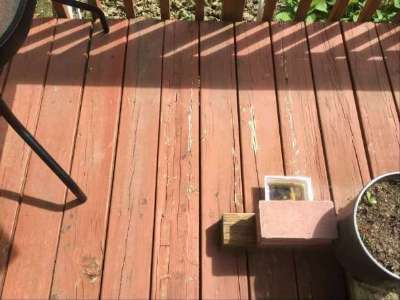 2) Back deck had deteriorated decking surfaces and some rot was present. 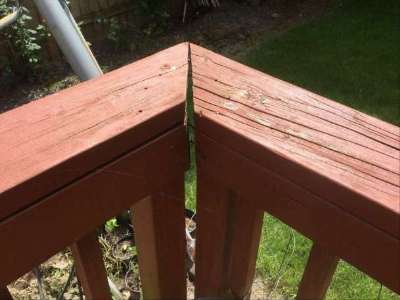 Cracking was present in decking boards. 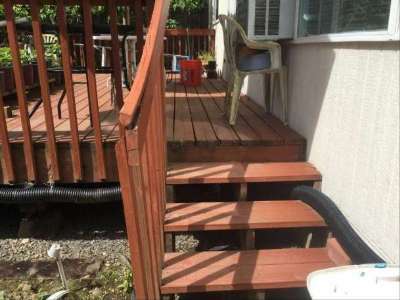 Railing was loose and deteriorated. All rotten wood should be replaced. Recommend repair and resurfacing by a qualified contractor. Limitations: The inspector performs a visual inspection of accessible components or systems at the exterior. 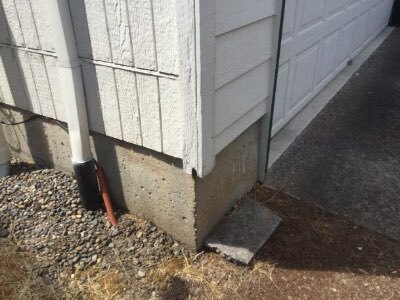 Items excluded from this inspection include below-grade foundation walls and footings; foundations, exterior surfaces or components obscured by vegetation, stored items or debris; wall structures obscured by coverings such as siding or trim. Some items such as siding, trim, soffits, vents and windows are often high off the ground, and may be viewed using binoculars from the ground or from a ladder. This may limit a full evaluation. 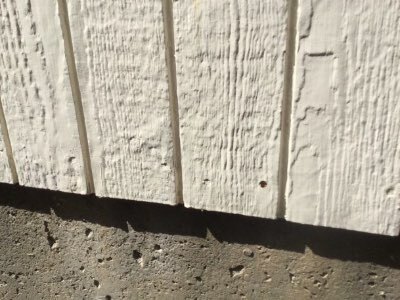 Regarding foundations, some amount of cracking is normal in concrete slabs and foundation walls due to shrinkage and drying. 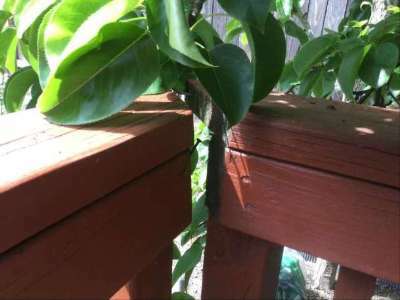 Note that the inspector does not determine the adequacy of seismic reinforcement. 3) Fungal rot was found at one or more sections of trim. Recommend that a qualified contractor repair as necessary. All rotten wood should be replaced. Front left corner of house and trim above porch area. 4) This property was clad with composition wood-fiber siding. Various manufacturers (e.g. Louisiana Pacific, Weyerhaeuser and Masonite) have produced this type of siding, which is made from oriented strand board (OSB) or "hardboard." It is prone to deteriorate and/or fail prematurely due to moisture penetration, especially when the paint coating is substandard or has not been maintained. Failure is typically visible in the form of swelling, cracking, buckling, wafer pops, delamination and fungal growth. 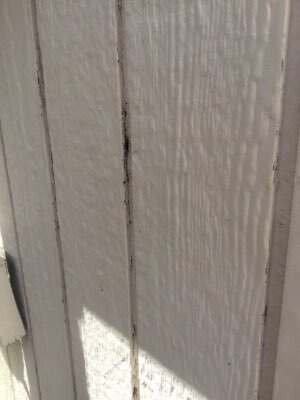 Some areas of siding on this structure showed symptoms described above and need maintenance. Some manufacturers (e.g. 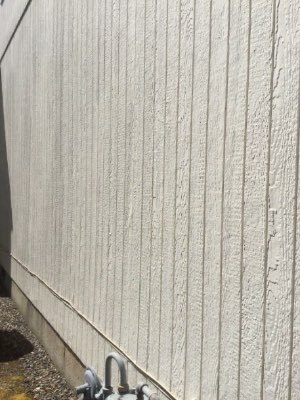 Louisiana Pacific) recommend a repair process for this siding where affected areas are sealed with Permanizer Plus, a flexible primer made by Pittsburgh Paint, followed by two coats of 100% acrylic latex paint. 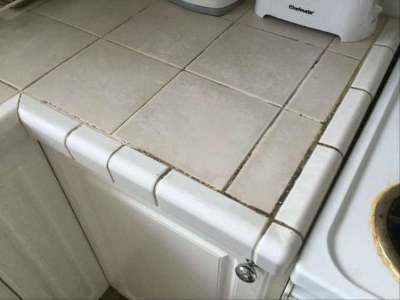 This sealant must be applied to the bottom edges using a brush. The face of the siding can be sprayed. The Permanizer Plus sealer isn't required for edges that aren't swollen, cracked or deteriorated, but the acrylic latex should still be brushed on these edges. Recommend that a qualified contractor evaluate and seal and repaint as necessary. 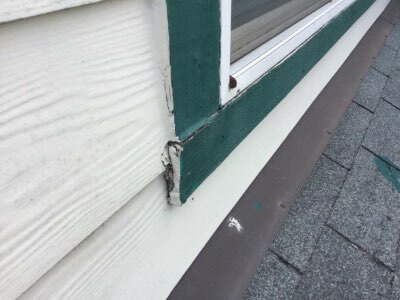 Repairs should be made per the siding and/or sealant manufacturer's installation instructions, and per standard building practices. 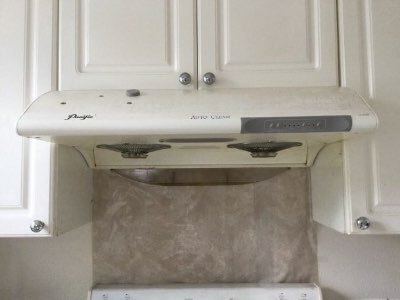 5) Recommend cleaning grease buildup from kitchen exhaust. 6) Caulk was deteriorated in some areas. For example, at siding-trim junctions. 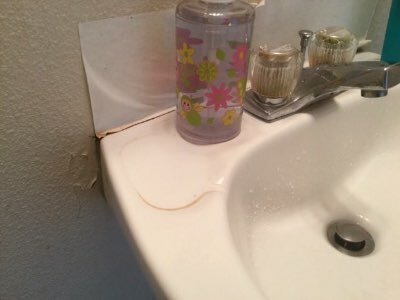 Recommend that a qualified person renew or install caulk as necessary. Limitations: Structural components such as joists and beams, and other components such as piping, wiring and/or ducting that are obscured by under-floor insulation are excluded from this inspection. The inspector does not determine if support posts, columns, beams, joists, studs, trusses, etc. are of adequate size, spanning or spacing. The inspector does not guarantee or warrant that water will not accumulate in the crawl spaces in the future. Complete access to all crawl space areas during all seasons and during prolonged periods of all types of weather conditions (e.g. heavy rain, melting snow) would be needed to do so. The inspector attempts to locate all crawl space access points and areas. Access points may be obscured or otherwise hidden by furnishings or stored items. In such cases, the client should ask the property owner where all access points are that are not described in this inspection, and have those areas inspected. Note that crawl space areas should be checked at least annually for water intrusion, plumbing leaks and pest activity. 7) One or more crawl space vents were intentionally blocked (e.g. removable panels). This restricts ventilation in the crawl space and can result in increased levels of moisture inside. Such vents should be left open at all times except during severe freezing weather. 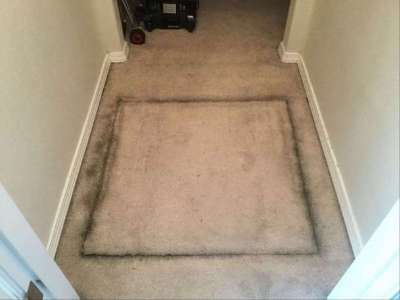 Recommend removing materials or items blocking vents as necessary. 8) Recommend cleaning mold from around crawlspace hatch and installing weather stripping at the hatch to prevent vapor entry. 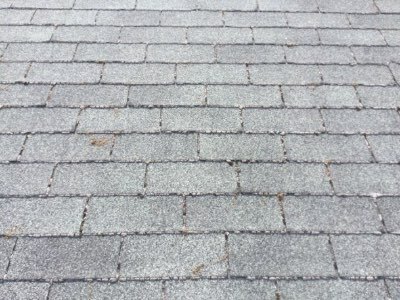 Limitations: The following items or areas are not included in this inspection: areas that could not be traversed or viewed clearly due to lack of access; solar roofing components. Any comments made regarding these items are made as a courtesy only. Note that the inspector does not provide an estimate of remaining life on the roof surface material, nor guarantee that leaks have not occurred in the roof surface, skylights or roof penetrations in the past. 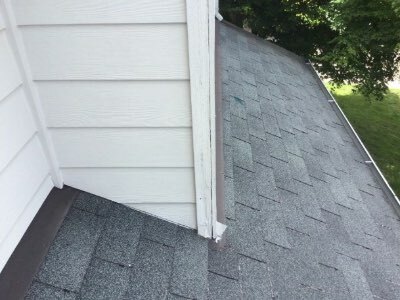 Regarding roof leaks, only active leaks, visible evidence of possible sources of leaks, and evidence of past leaks observed during the inspection are reported on as part of this inspection. The inspector does not guarantee or warrant that leaks will not occur in the future. Complete access to all roof and attic spaces during all seasons and during prolonged periods of all types of weather conditions (e.g. high wind and rain, melting snow) would be needed to do so. Occupants should monitor the condition of roofing materials in the future. For older roofs, recommend that a professional inspect the roof surface, flashings, appurtenances, etc. annually and maintain/repair as might be required. If needed, the roofer should enter attic space(s). 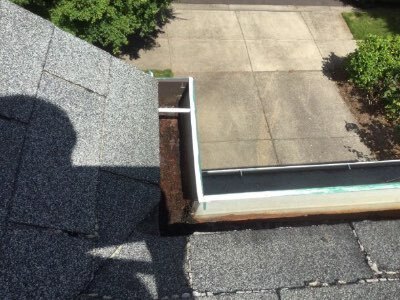 Regarding the roof drainage system, unless the inspection was conducted during and after prolonged periods of heavy rain, the inspector was unable to determine if gutters, downspouts and extensions perform adequately or are leak-free. 9) Debris present in gutters. Gutters can overflow and cause water to come in contact with the building exterior, or water can accumulate around the foundation. 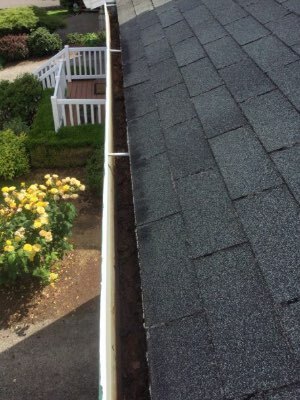 Recommend cleaning gutters and downspouts now and as necessary in the future. 10) Moss was growing on the roof. As a result, shingles can lift or be damaged. 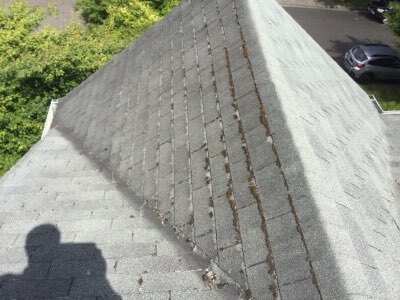 Leaks can result and/or the roof surface can fail prematurely. Efforts should be made to kill the moss during its growing season (wet months). Typically, zinc or phosphate-based chemicals are used for this and must be applied periodically. 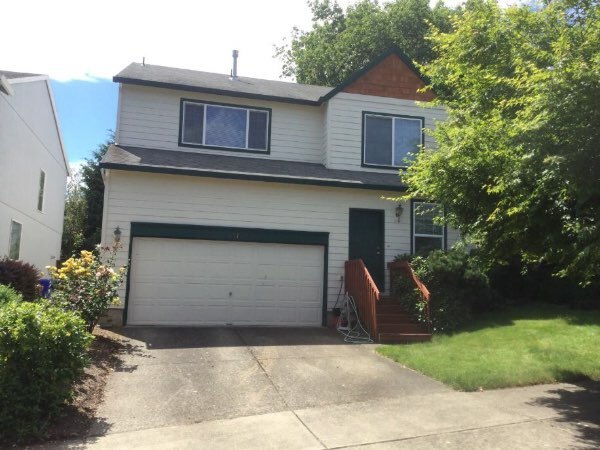 Limitations: The following items or areas are not included in this inspection: areas that could not be traversed or viewed clearly due to lack of access; areas and components obscured by insulation. Any comments made regarding these items are made as a courtesy only. 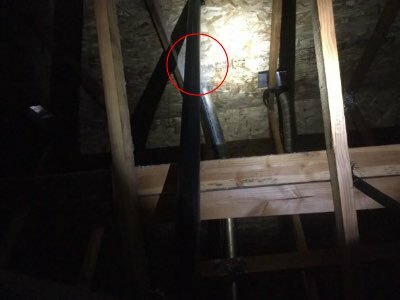 The inspector does not determine the adequacy of the attic ventilation system. Complete access to all roof and attic spaces during all seasons and during prolonged periods of all types of weather conditions (e.g. high/low temperatures, high/low humidity, high wind and rain, melting snow) would be needed to do so. The inspector is not a licensed engineer and does not determine the adequacy of roof structure components such as trusses, rafters or ceiling beams, or their spacing or sizing. 11) Clothes dryer exhaust duct in the attic was loose. Recommend that a qualified person make permanent repairs as necessary. Limitations: The inspector does not determine the adequacy of firewall ratings. Requirements for ventilation in garages vary between municipalities. Limitations: The following items are not included in this inspection: generator systems, transfer switches, surge suppressors, inaccessible or concealed wiring; underground utilities and systems; low-voltage lighting or lighting on timers or sensors. Any comments made regarding these items are as a courtesy only. 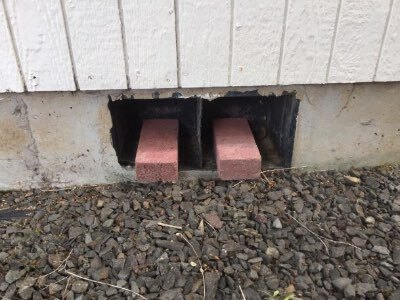 Note that the inspector does not determine the adequacy of grounding or bonding, if this system has an adequate capacity for the client's specific or anticipated needs, or if this system has any reserve capacity for additions or expansion. 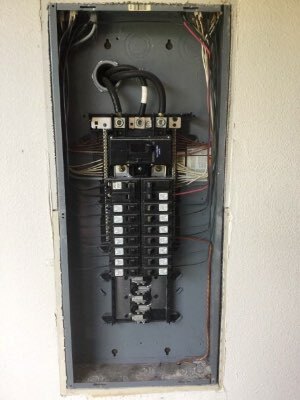 The inspector does not operate circuit breakers as part of the inspection, and does not install or change light bulbs. The inspector does not evaluate every wall switch or receptacle, but instead tests a representative number of them per various standards of practice. When furnishings, stored items or child-protective caps are present some receptacles are usually inaccessible and are not tested; these are excluded from this inspection. Receptacles that are not of standard 110 volt configuration, including 240-volt dryer receptacles, are not tested and are excluded. The functionality of, power source for and placement of smoke and carbon monoxide alarms is not determined as part of this inspection. Upon taking occupancy, proper operating and placement of smoke and carbon monoxide alarms should be verified and batteries should be changed. These devices have a limited lifespan and should be replaced every 10 years. The inspector attempts to locate and evaluate all main and sub-panels. However, panels are often concealed. If panels are found after the inspection, a qualified electrician should evaluate and repair if necessary. The inspector attempts to determine the overall electrical service size, but such estimates are not guaranteed because the overall capacity may be diminished by lesser-rated components in the system. Any repairs recommended should be made by a licensed electrician. 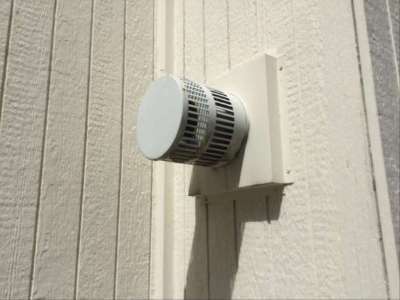 12) Based on the age of this structure and the appearance of existing smoke alarms, the alarms may have been installed more than 10 years ago. According to National Fire Protection Association, aging smoke alarms don't operate as efficiently and often are the source for nuisance alarms. Older smoke alarms are estimated to have a 30% probability of failure within the first 10 years. 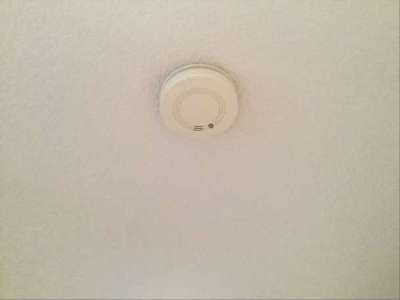 Newer smoke alarms do better, but should be replaced after 10 years. 13) Main electrical panel in garage. Limitations: The following items are not included in this inspection: private/shared wells and related equipment; private sewage disposal systems; hot tubs or spas; main, side and lateral sewer lines; gray water systems; pressure boosting systems; trap primers; incinerating or composting toilets; fire suppression systems; water softeners, conditioners or filtering systems; plumbing components concealed within the foundation or building structure, or in inaccessible areas such as below tubs; underground utilities and systems; overflow drains for tubs and sinks; backflow prevention devices. Any comments made regarding these items are as a courtesy only. Note that the inspector does not operate water supply or shut-off valves due to the possibility of valves leaking or breaking when operated. The inspector does not test for lead in the water supply, the water pipes or solder, does not determine if plumbing and fuel lines are adequately sized, and does not determine the existence or condition of underground or above-ground fuel tanks. 14) Water meter at front of house. Main water shutoff in garage. 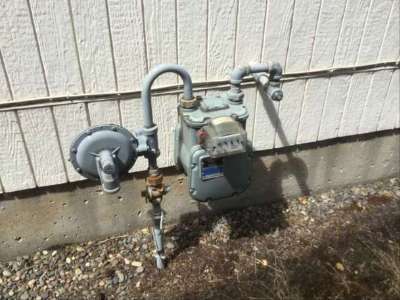 15) Main gas shutoff at meter - left side of house. 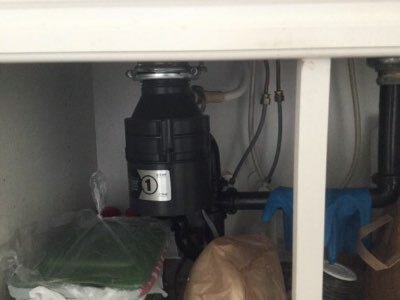 Limitations: Evaluation of and determining the adequacy or completeness of the following items are not included in this inspection: water recirculation pumps; solar water heating systems; Energy Smart or energy saver controls; catch pan drains. Any comments made regarding these items are as a courtesy only. 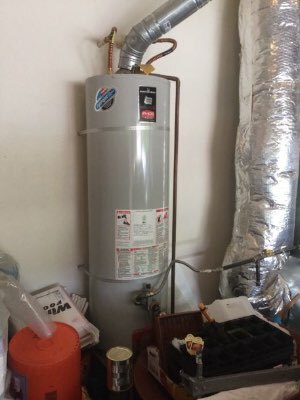 Note that the inspector does not provide an estimate of remaining life on water heaters, does not determine if water heaters are appropriately sized, or perform any evaluations that require a pilot light to be lit or a shut-off valve to be operated. 16) The estimated useful life for most water heaters is 8-12 years. This water heater appeared to be beyond this age and/or its useful lifespan and may need replacing at any time. Recommend budgeting for a replacement in the near future. Limitations: The following items are not included in this inspection: humidifiers, dehumidifiers, electronic air filters; solar, coal or wood-fired heat systems; thermostat or temperature control accuracy and timed functions; heating components concealed within the building structure or in inaccessible areas; underground utilities and systems; safety devices and controls (due to automatic operation). Any comments made regarding these items are as a courtesy only. Note that the inspector does not provide an estimate of remaining life on heating or cooling system components, does not determine if heating or cooling systems are appropriately sized, does not test coolant pressure, or perform any evaluations that require a pilot light to be lit, a shut-off valve to be operated, a circuit breaker to be turned "on" or a serviceman's or oil emergency switch to be operated. 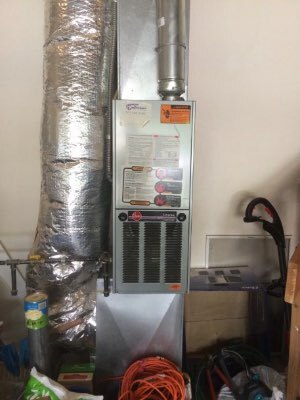 It is beyond the scope of this inspection to determine if furnace heat exchangers are intact and free of leaks. 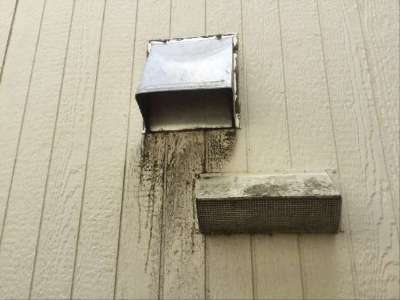 Condensation pans and drain lines may clog or leak at any time and should be monitored while in operation in the future. Where buildings contain furnishings or stored items, the inspector may not be able to verify that a heat source is present in all "liveable" rooms (e.g. bedrooms, kitchens and living/dining rooms). Limitations: The following items are not included in this inspection: coal stoves, gas logs, chimney flues (except where visible). Any comments made regarding these items are as a courtesy only. 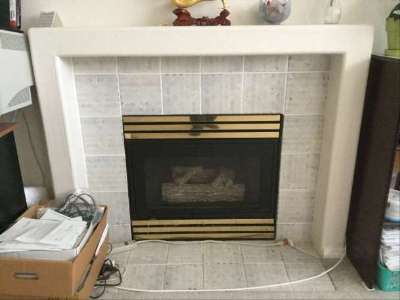 Note that the inspector does not determine the adequacy of drafting or sizing in fireplace and stove flues, and also does not determine if prefabricated or zero-clearance fireplaces are installed in accordance with the manufacturer's specifications. The inspector does not perform any evaluations that require a pilot light to be lit, and does not light fires. The inspector provides a basic visual examination of a chimney and any associated wood burning device. The National Fire Protection Association has stated that an in-depth Level 2 chimney inspection should be part of every sale or transfer of property with a wood-burning device. 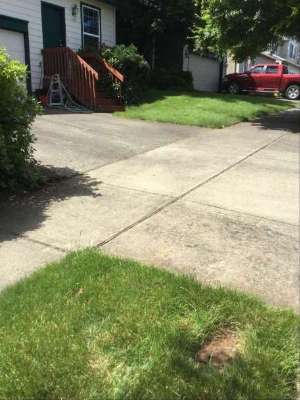 Such an inspection may reveal defects that are not apparent to the home inspector who is a generalist. 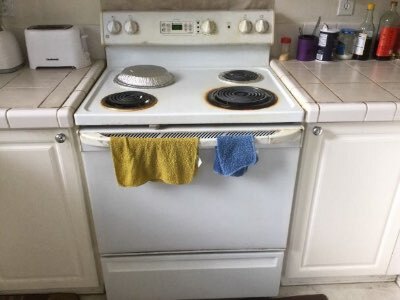 Limitations: The following items are not included in this inspection: household appliances such as stoves, ovens, cook tops, ranges, warming ovens, griddles, broilers, dishwashers, trash compactors, refrigerators, freezers, ice makers, hot water dispensers and water filters; appliance timers, clocks, cook functions, self and/or continuous cleaning operations, thermostat or temperature control accuracy, and lights. Any comments made regarding these items are as a courtesy only. 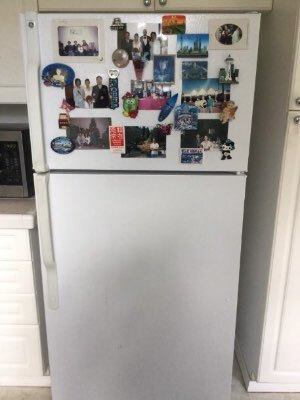 Note that the inspector does not provide an estimate of the remaining life of appliances, and does not determine the adequacy of operation of appliances. The inspector does not note appliance manufacturers, models or serial numbers and does not determine if appliances are subject to recalls. 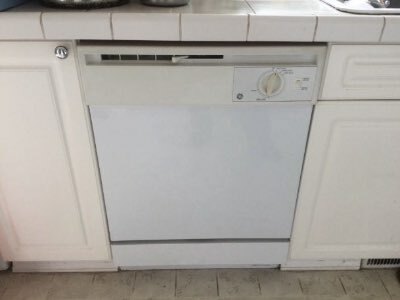 Areas and components behind and obscured by appliances are inaccessible and excluded from this inspection. 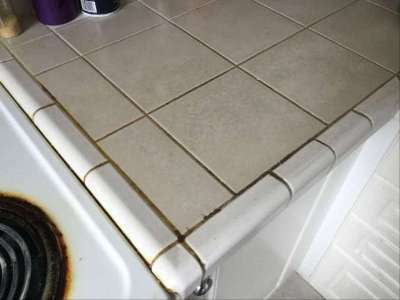 19) Grout at kitchen countertop was worn/deteriorated/dirty. 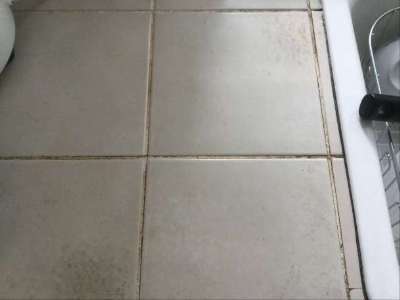 Recommend cleaning and regrouting as necessary. 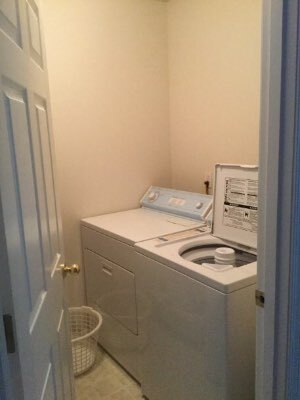 Limitations: The following items are not included in this inspection: overflow drains for tubs and sinks; heated towel racks, saunas, steam generators, clothes washers, clothes dryers. Any comments made regarding these items are as a courtesy only. 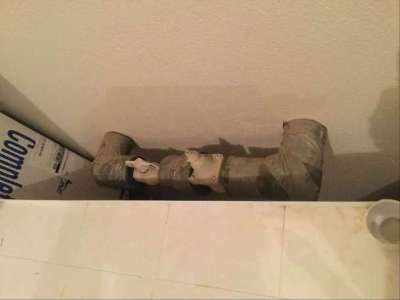 Note that the inspector does not determine the adequacy of washing machine drain lines, washing machine catch pan drain lines, or clothes dryer exhaust ducts. 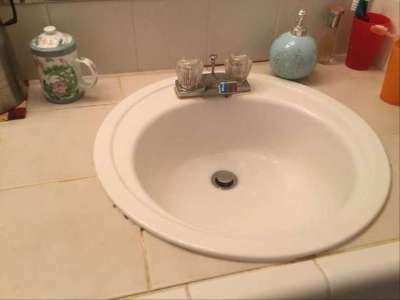 The inspector does not operate water supply or shut-off valves for sinks, toilets, bidets, clothes washers, etc. due to the possibility of valves leaking or breaking when operated. 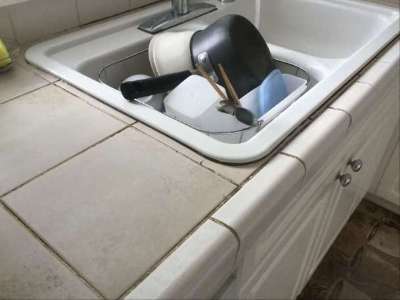 The inspector does not determine if shower pans or tub and shower enclosures are water tight, or determine the completeness or operability of any gas piping to laundry appliances. 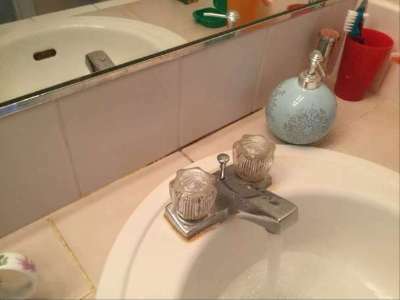 21) The sink at location(s) #A was loose and caulk was deteriorated at the backsplash, minor water damage present. 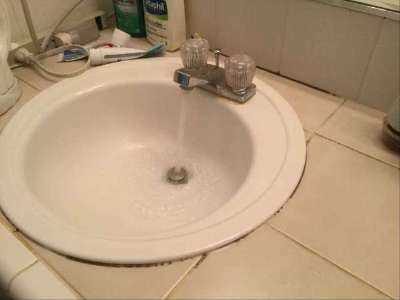 Recommend that a qualified contractor adhere the sink to the wall and caulk at the backsplash. 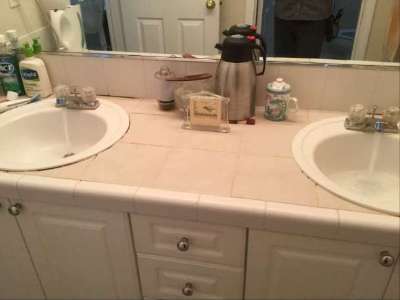 22) Master bathroom countertop had deteriorated/dirty grout. Recommend cleaning and regrouting as necessary. 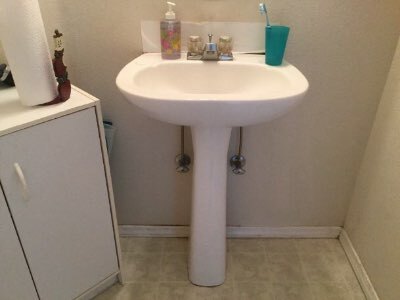 23) Master bathroom sink drained slowly. Recommend clearing P-trap. Limitations: The following items are not included in this inspection: security, intercom and sound systems; communications wiring; central vacuum systems; elevators and stair lifts; cosmetic deficiencies such as nail-pops, scuff marks, dents, dings, blemishes or issues due to normal wear and tear in wall, floor and ceiling surfaces and coverings, or in equipment; deficiencies relating to interior decorating; low voltage and gas lighting systems. Any comments made regarding these items are as a courtesy only. Note that the inspector does not evaluate any areas or items which require moving stored items, furnishings, debris, equipment, floor coverings, insulation or similar materials. The inspector does not test for asbestos, lead, radon, mold, hazardous waste, urea formaldehyde urethane, or any other toxic substance. Some items such as window, drawer, cabinet door or closet door operability are tested on a sampled basis. The client should be aware that paint may obscure wall and ceiling defects, floor coverings may obscure floor defects, and furnishings may obscure wall, floor and floor covering defects. If furnishings were present during the inspection, recommend a full evaluation of walls, floors and ceilings that were previously obscured when possible. Determining the cause and/or source of odors is not within the scope of this inspection. 25) Condensation or staining was visible between multi-pane glass in one or more windows. 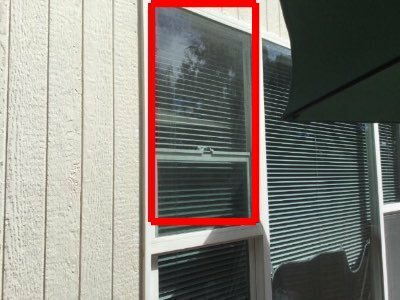 This usually indicates that the seal between the panes of glass has failed or that the desiccant material that absorbs moisture is saturated. As a result, the view through the window may be obscured, the window's R-value will be reduced, and accumulated condensation may leak into the wall structure below. Recommend that a qualified contractor evaluate and repair windows as necessary. Usually, this means replacing the glass in window frames. Photo 25-1 Window above AC unit. 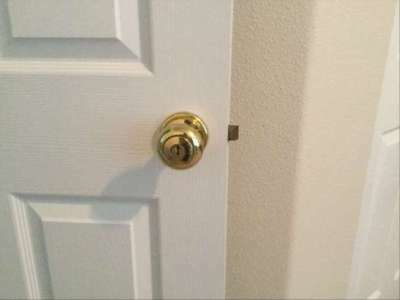 26) Recommend replacing keyed bedroom hardware with standard hardware. Limitations: This report only includes findings from accessible and visible areas on the day of the inspection. In addition to the inaccessible areas documented in this report, examples of other inaccessible areas include: sub areas less than 18 inches in height; attic areas less than 5 feet in height, areas blocked by ducts, pipes or insulation; areas where locks or permanently attached covers prevent access; areas where insulation would be damaged if traversed; areas obscured by vegetation. All inaccessible areas are subject to infestation or damage from wood-destroying organisms. The inspector does not move furnishings, stored items, debris, floor or wall coverings, insulation, or other materials as part of the inspection, nor perform destructive testing. Wood-destroying organisms may infest, re-infest or become active at any time. No warranty is provided as part of this inspection.